Credit and debit card data theft poses a very real threat to your business and can result in a damaged reputation and high fines. 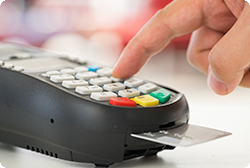 Training on compliance with the Payment Card Industry Data Security Standard (PCI DSS) will protect the credit card information of your customers. This online training module details the procedures employees must follow to comply with PCI DSS. Your employees will learn important card security issues, what is sensitive card holder data, and the rules you must follow to prevent credit and debit card data theft.